Chung, J., Naficy, S., yue, Z., Kapsa, R. M., Quigley, A. F., Moulton, S. E. & Wallace, G. G. (2013). Bio-ink properties and printability for extrusion printing living cells. Journal of Biomaterials Science: Polymer Edition, 1 (7), 763-773. Additive biofabrication (3D bioprinting) makes it possible to create scaffolds with precise geometries, control over pore interconnectivity and architectures that are not possible with conventional techniques. Inclusion of cells within the ink to form a “bio-ink” presents the potential to print 3D structures that can be implanted into damaged/diseased tissue to promote highly controlled cell-based regeneration and repair. The properties of an ‘ink’ are defined by its formulation and critically influence the delivery and integrity of structure formed. Importantly, the ink properties need to conform to biological requirements necessary for the cell system that they are intended to support and it is often challenging to find conditions for printing that facilitate this critical aspect of tissue bioengineering. In this study, alginate (Alg) was selected as the major component of the ‘bio-ink’ formulations for extrusion printing of cells. 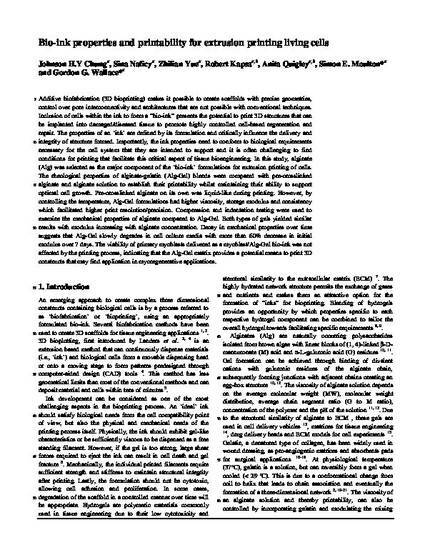 The rheological properties of alginate-gelatin (Alg-Gel) blends were compared with pre-crosslinked alginate and alginate solution to establish their printability whilst maintaining their ability to support optimal cell growth. Pre-crosslinked alginate on its own was liquid-like during printing. However, by controlling the temperature, Alg-Gel formulations had higher viscosity, storage modulus and consistency which facilitated higher print resolution/precision. Compression and indentation testing were used to examine the mechanical properties of alginate compared to Alg-Gel. Both types of gels yielded similar results with modulus increasing with alginate concentration. Decay in mechanical properties over time suggests that Alg-Gel slowly degrades in cell culture media with more than 60% decrease in initial modulus over 7 days. The viability of primary myoblasts delivered as a myoblast/Alg-Gel bio-ink was not affected by the printing process, indicating that the Alg-Gel matrix provides a potential means to print 3D constructs that may find application in myoregenerative applications.